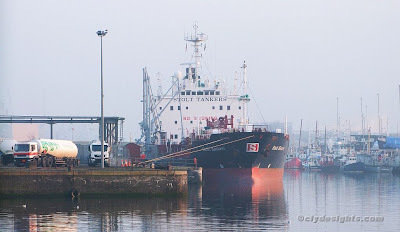 The River Clyde's first-footer this year was the tanker STOLT KESTREL, seen here at the NuStar berth in Rothesay Dock. Owned by Stolt Tankers - a well known tanker company but not a name commonly seen on the Clyde - she was built in Japan by Fukuoka Shipbuilding in 1992. She is 99.9 metres in length, and has a deadweight of 5,741 tonnes. STOLT KESTREL was bringing a load of fuel from the Mersey. Registered at George Town in the Cayman Islands, she carries a British master, with Latvian, Russian, Ukranian and Filipino nationals making up the remainder of her crew. Thanks for blogging in 2008 John and look forward to 2009 blogs. Wishing you all the best for 2009.